Another Beautiful Day in Paradise. We had nice clear blue skies, temperatures in the 80s and a little breeze out of the SE. 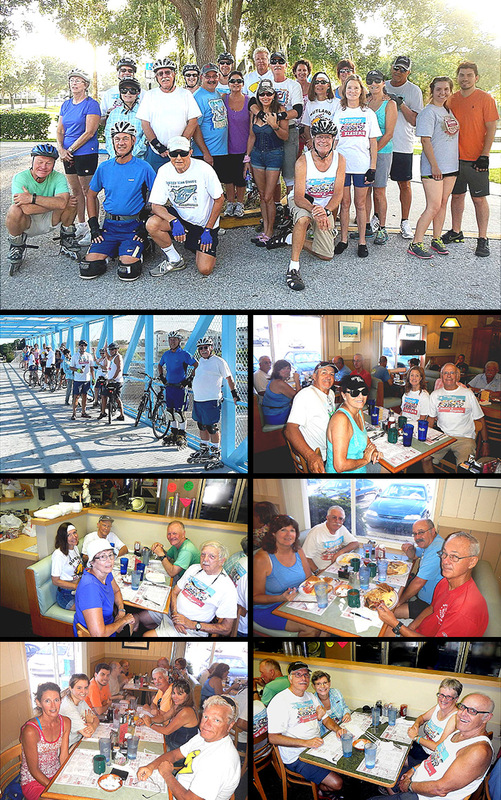 Bladers/bicyclers Nancy & Bob L (Bob missed the picture), Dan & Linda C, Dee T, Rob & Amie H, Wilma & Jim F, Olivia M & Pete K, Jim H & Terri S, Joanie C, Barbara M, Dorey Anne, Ginnie S & Rick P, Stephanie & Lewis, John L, Jeff B, Steve G and Bruce M Came. Welcome all. We headed North on the Pinellas Trail. One group turned around at West Bay Dr for 11 miles and one group turned around at Belleview Blvd for 14.5 miles. We had 6 bladers & 18 bicyclers. We Brunched at Doe Does as planned. Our first group got in and seated after about a 10 minute wait. Since we arrived in groups, we ended up sitting at 5 different tables. Service was good considering Doe Does was busy. The food was great as usual and we gave Does Does a 9.6.